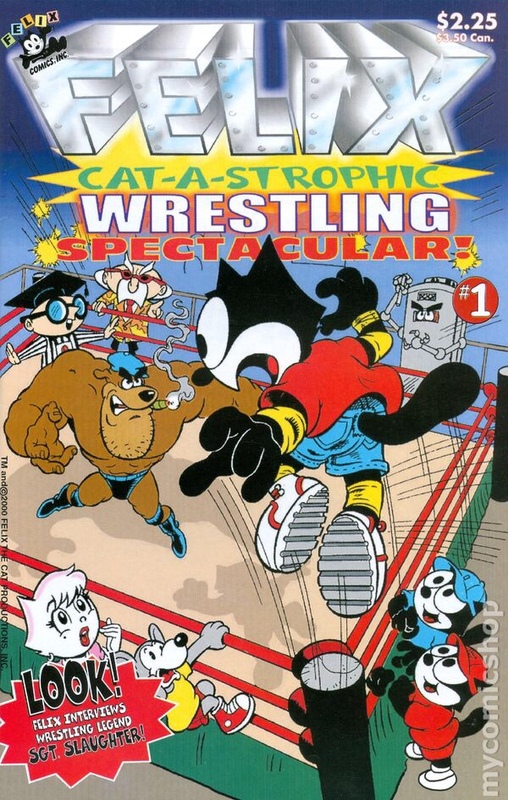 Here’s a list of Saturday morning cartoons turned wrestling-themed comic book covers. We’ll start with this one only to highlight a common problem with certain artists’ rendition of the squared circle: not knowing how many sets of ropes a wrestling ring has. In the Marvel post of wrestling comic book covers, we saw that an extra set was added, essentially making it a boxing ring. Here, you’ll see there’s only two. Maybe it’s a height thing, since these are little ponies. 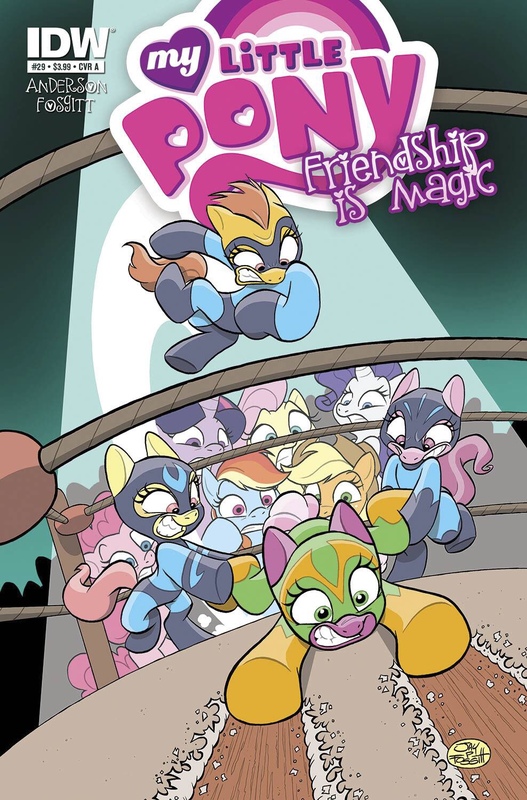 Also, are bronies that are into wrestling called jabronies? Has this been a cosplay thing at comic conventions? If not, someone is definitely lagging. 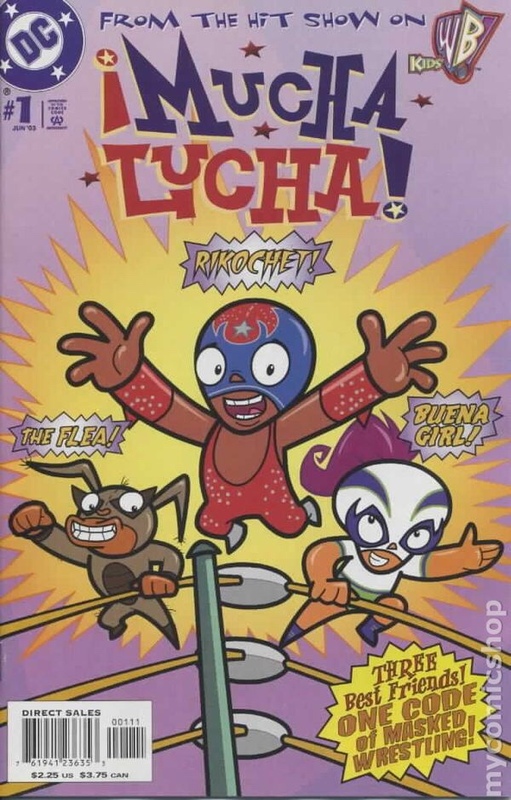 This one is kind of unfair to include on this list because the entire premise of this cartoon was based on three young lucha libre trainees. Yet, their comic book cover for issue #1 leaves a lot to be desired of. Even the My Little Pony crew gave us part of a ring and a nondescript shadow of an audience. All we get here is a bland variation of purple as a backdrop and just a ring post with some ropes that’ll make your head hurt if you stare at it for too long. I mean, are they jumping into the ring, or out of it? The placement of the ring post says outside, but the angle of the ropes suggests inside. It’s like a damn optical illusion. This cover also foregoes the audience background in favor of a Sears family portrait backdrop. Surprisingly, out of these 10 covers there’s only one that has a bootleg Hulk Hogan. If Hulk Hogan joined the Legion of Doom. Or Kiss, as suggested by Yakko’s “Rock ‘n’ Roll All Nite” reference. Another musical pop culture reference from the Animaniacs that kids wouldn’t get, only not as dirty. That is a lot of face paint for one match, though. The 1990 Survivor Series match between The Warriors and The Perfect Team must’ve left a big impression on one of the artists. 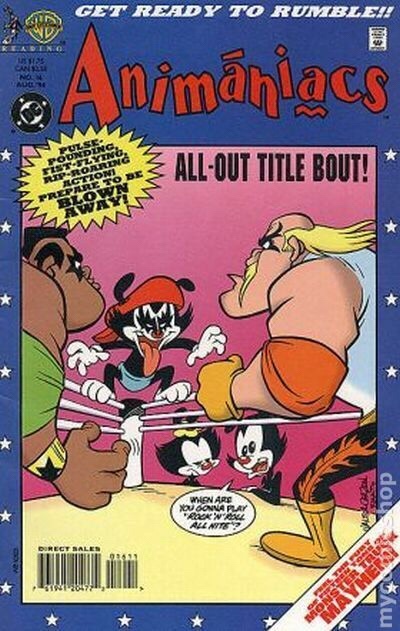 You’d think they’d at least reference the Animaniacs wrestling episode. This comic book is another offender of the three-rope rule. 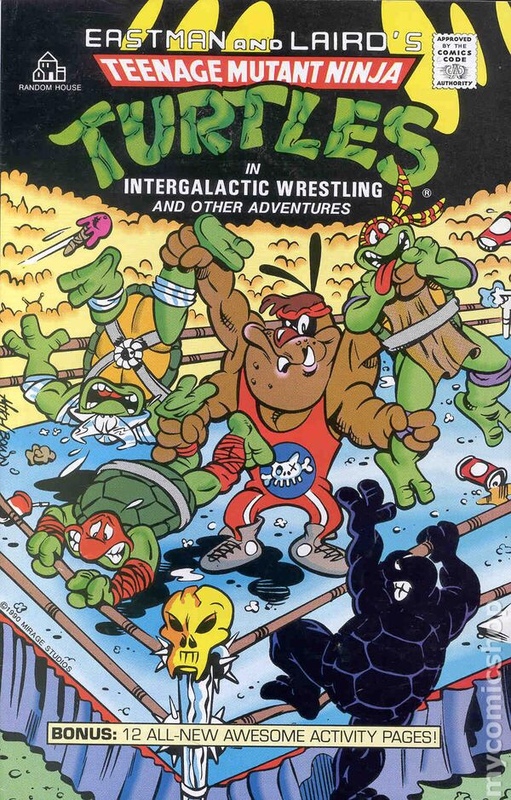 Far too superior to take on regular human wrestlers, the four turtle brothers find that they’re not as strong in the intergalactic wrestling circuit. Looks like their opponent, who we’ll call the Trashyard Mutt, conveniently has enough arms to take on each individual turtle. The crowd is either for the turtles getting beat, or trying to deter the Mutt from doing more damage, judging by the amount of garbage being thrown in the ring. Also, you won’t find many crowds drawn in the background of most of these comics. Especially, one that looks like the result of a popcorn machine gone haywire. 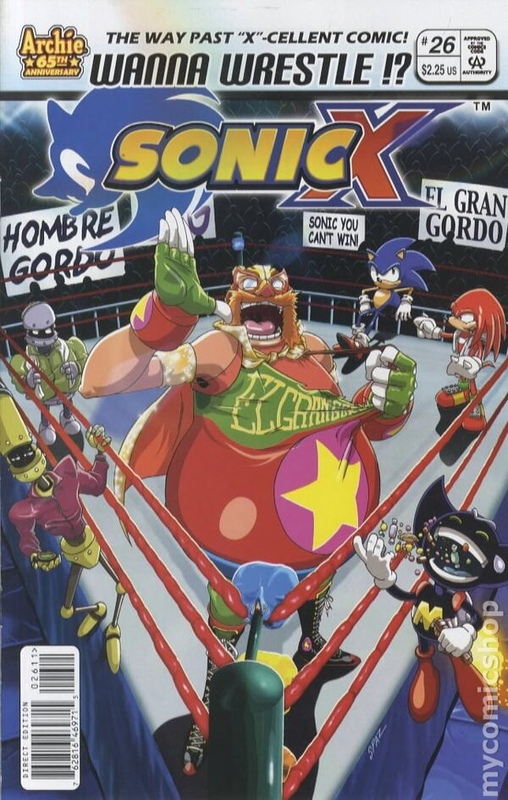 In this Sonic the Hedgehog comic book series, Dr. Robotnik is a luchador who goes by the name El Gran Gordo, a.k.a. The Grand Fatty. And he is super over with the crowd, as you can tell by the floating signs. It also looks like he’s got the crew of Mystery Science Theater 3000 as his cornermen, but Sonic doesn’t seem too phased by it considering he has Knuckles by his side. They’re also wrestling in the best looking ring you’re going to find on this list. Felix the Cat was another in a long line of animated cats, and probably the oldest. But will always be remembered for being mistaken for the classic cat clock that everyone had at one time or another. Here he is taking on his fight forever rival, the animated dog. Although, for whatever reason, there’s a cartoon mouse that’s in Felix’s corner, which defies logic as far as cartoon rivalries go. Maybe he’s planning to turn against Felix mid-match. There’s a lot going on here, including a referee with a graduation cap, an anthropomorphic water heater, and a blurb at the bottom that promises an interview with wrestling legend Sgt. Slaughter somehow conducted by Felix himself. Here’s one that didn’t make the Marvel list. Sadly, none of the wrestling characters from the show’s classic wrestling episode make an appearance. Instead of Lump and Loaf, we get Lump and Loaf lite. And despite wearing their masks, Ren and Stimpy don’t seem to be in full Mad Dog Hoek and Killer Kadoogan character. Instead, they look like they’re going for more of a “Man Scout” Jake Manning vibe. 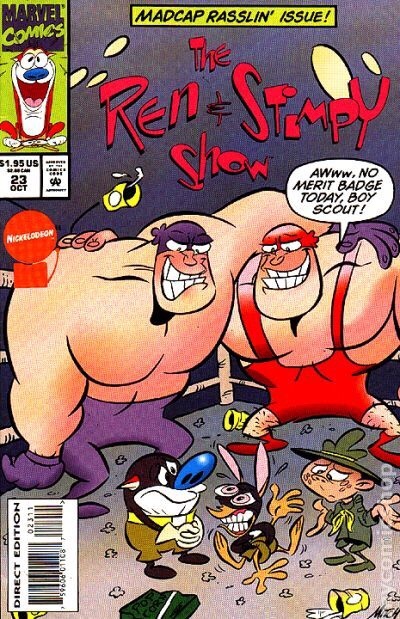 Unlike the rest of these covers, the fact that there’s a random boy scout and Ren and Stimpy as scouts inside a wrestling ring actually makes it an intriguing buy. Like, there’s actually a story already being told on the cover. So far, it seems like children’s comic books like to throw in a wrestling storyline somewhere between issue 25 and 29. The Simpsons comic is no exception. Here we see Homer finally don a wrestling outfit, seeing as we we’ve been robbed of it in all the Simpsons episodes that have shown wrestling. Not surprisingly, he goes with a USA ensemble. He is, after all, what most people perceive to be your typical American pro wrestling fan. 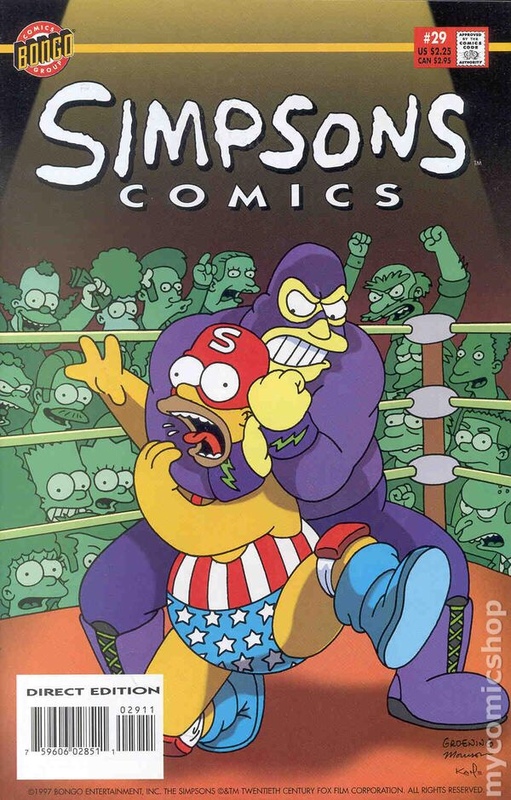 It’s hard to tell who the grape colored masked wrestler is (seeing as he isn’t one of the top 10 Simpsons wrestlers), but he definitely has a mean streak that overcompensates for his outfit. The world of The Simpsons is so big that having faceless half circles as the audience would’ve been a disservice to the series, so it’s cool that the artist decided to draw attention to a few of the show’s central characters. Another Marvel title that was cut from the Marvel post. 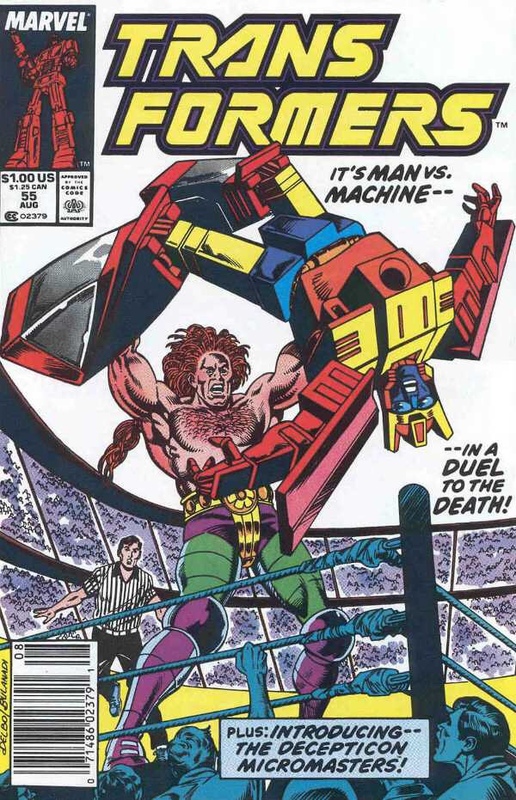 This cover is clearly the inspiration for How I Met Your Mother’s “Robots vs. Wrestlers” episode. This is definitely taking place some time in the future as the human wrestler looks more futuristic than Tekno Team 2000. I’m not sure who the Transformer is, but with a tagline that promises a “duel to the death!”, and Transformers showing kids early on that they’re willing to go that far thanks to their 1986 movie, there’s a good chance this comic book issue will actually deliver on the first wrestling match that ends when one opponent kills the other. Was there every any doubt that Tweety Bird would come out on top in a battle between him and Sylvester? Luckily, Roman Reigns was only lifting lines from Sylvester and not studying his wrestling technique. Granted, it looks like Tweety had some help from Egghead Jr., who’s invented a figure four that far exceeds Charlotte Flair’s Figure 8 Leg Lock. Instead of a faceless crowd, we get camera flashes which is a nice creative touch. The only thing that could’ve made this better was if this cover included Looney Tunes and Merrie Melodies’ favorite wrestler, The Crusher.